Simple images designed to convey information about prescription drugs could help save lives and reduce the economic burden of non-adherence to treatment. New research published in Applied Ergonomics shows that including pictograms on written medication instructions helps seniors take their drugs correctly. Patients with multiple prescriptions can easily get confused and take the wrong medication, leading to hospitalization and even death. The Centers for Disease Control and Prevention (CDC) estimates that the cost of non-adherence to prescriptions, by taking the medicine at the wrong dose, time or frequency, is between $100-289 billion every year. Nine different pharmaceutical pictograms that could help older people understand written medical information. The researchers behind the study, from the City University of Hong Kong, say health professionals could include pictograms on any written medication information to help patients and free up medical resources. “Drugs are necessary to treat diseases and relieve symptoms, however, improper use of drugs can lead to serious consequences such as stomach bleeding and poisoning. We wanted to see if supplementary pictograms could help older people understand how to take their medication safely,” explained Dr. Annie Ng, lead author from the City University of Hong Kong. In the new study, the researchers asked seniors to read and understand the medical instructions printed on five different drugs. One group received this information using plain text and the other group were provided with a range of pictograms to support the text. “Information on medicine labels can sometimes be confusing, especially if a patient has several medications to contend with. 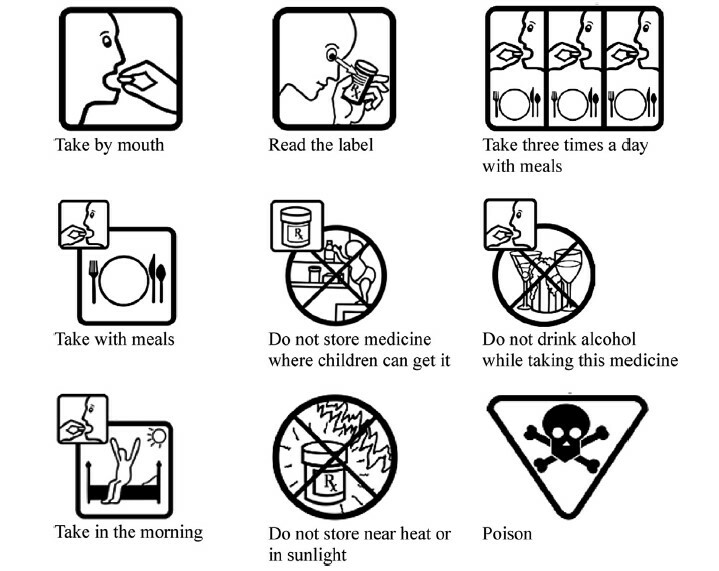 Including a few simple pictures on a medicine label helps older people to read and understand this information. This not only prevents accidental overdose, it relieves some of the pressure that our aging population is putting on the health service by avoiding preventable tragedies,” Dr. Ng added. For the study, a group of 50 people aged 65 to 84 had to complete a medical information comprehension task. They were educated to varying levels, from primary to university level, and all had normal or corrected-to-normal vision. They each took one of five drugs commonly used by older people. The team found that participants with a lower education level demonstrated a poorer understanding of the medication information. This, the researchers say, means it is important to give extra consideration to seniors with lower levels of education. The researchers chose to focus on seniors as they form the largest group of medication users and are more likely to suffer from multiple chronic diseases, therefore taking multiple drug therapies. Physicians explain to their patients how to take medication, but when faced with an array of pills, older patients only remember about 20-60 percent of the instructions they’ve heard. The article is "Comprehension by older people of medication information with or without supplementary pharmaceutical pictograms," by Annie W.Y. Ng, Alan H.S. Chan amd Vincy W.S. Ho (doi:10.1016/j.apergo.2016.06.005). It appears in Applied Ergonomics, volume 58 (2017), published by Elsevier.